The Black-tailed Godwit (Limosa limosa), is a large, long-legged, long-billed shorebird with an orange head, neck and chest in breeding plumage and distinctive black and white wingbar at all times. The Black-tailed Godwit has a widespread but disjunct distribution in the Western Palearctic. Two subspecies occur in this area; islandica which breeds mainly in Iceland and limosa with a main breeding range from The Netherlands to Russia. The species increased during the 20th century throughout the Western Palearctic. But while the islandica population has continued to increase in numbers and expanded its breeding range, nominate limosa has shown range contraction and major declines in most key breeding areas during the last decades. The decrease of this meadow-bird is mostly related to intensification of agriculture and habitat loss which caused the IUCN to change its status on Red List of Threatened Species to “Near Threatened”. 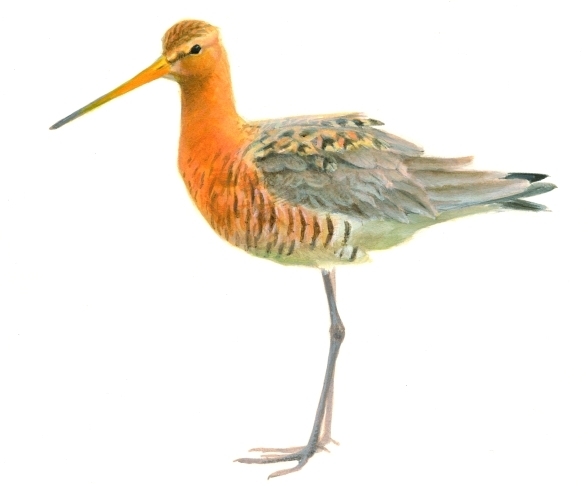 In order to halt the decline and save the Black-tailed Godwit across its range, international cooperation is a must. Under the framework of the African-Eurasian Migratory Waterbird Agreement (AEWA) and the AEWA International Single Species Action Plan for the Conservation of the Black-tailed Godwit, an inter-governmental International Species Working Group is being set-up along the flyway of the Western Palearctic Black-tailed Godwit.